“Everything we do is in Boston, it’s like our experimental area; then we scale that across the different sites,” says Wilson-Rich, founder and Chief Scientific Officer of Boston-based The Best Bees Company. Custom built hives, installation and monthly maintenance as well as the bees necessary to make the whole thing work runs anywhere from $1000-$2,500 annually depending on the scope of the project and the needs of the customer. This includes everything from bee replacement to honey harvest help. Best Bees collects and shares with its customers detailed hive data that provides the foundation for the company’s in-house research. At The Urban Beekeeping Laboratory, Wilson-Rich and other researchers from Best Bees collaborate with external researchers and scientists on honey bee research. The lab has a number of current projects including overwintering surveys, a regional queen rearing program and their SmartHive data collection equipment development. “Studies show that the city bees are living longer and they are also producing more honey. Data shows there are more bee species in cities compared to the surrounding country,” says Wilson-Rich. “In the cities that we’re in, we’re seeing more often than not the urban beekeeping effect.” This effect, of stronger healthier bees displaying more diversity, is in direct correlation with a diversity of native plant species. By experimenting in ‘honey DNA’ and mapping the genome of a given honey sample, Wilson-Rich can identify the type of honey (flower flavor) and then, by the flowers, which area the honey originates from. “What we have discovered is that beehives are doing better in areas with greater floral diversity,” says Wilson-Rich. These florally diverse regions are more likely to be urban in nature rather than suburban due to the damaging effects of uniform landscaping found in the average suburban neighborhood. Placing more bees in an area where they are likely to thrive is at the heart of Best Bees’ company mission. 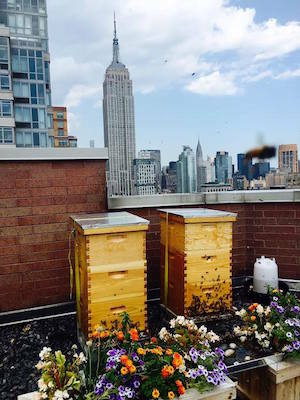 By providing private residences, small businesses and public service institutions with apiaries in America’s metropolitan areas, Wilson-Rich and his well-trained employees introduce Italian honeybees into the urban ecosystem, a species of honey bee known for its calm and docile nature —“very laid back” according to Wilson-Rich. Best Bees is acting on the city bee findings building strong hives across city centers in 15 states. The Bee lab and the accompanying Bee Sanctuary are both nonprofits funded by the company’s for-profit beekeeping subscription model business. By asking customers to pay for the raw materials to build their hives up front and the remainder of the balance at installation, Wilson-Rich was able to build his business and his research foundation with no startup capital; just slowly, one hive at a time, one customer at a time. When not helping design new beehives, analyze hive data or ministering to the daily needs of the American bee business, Wilson-Rich spends a large portion of his time promoting the pollinator party line. With guest lectures, magazine articles, Ted Talks and even a book, The Bee: A Natural History which came out in 2014, Wilson-Rich has made it his professional life’s work to spread the bee cause while building a profitable, mutually-beneficial social enterprise.